My uni exams finished at the end of April, so since then it's basically been summer for me! I've been thinking of all the summer blog and Instagram content I could come up with, so I wanted to make a start with this post. As it is now the middle/nearing the end of May, I think it's acceptable to talk all things summer, especially as the weather in the UK has been somewhat summery. With that being said, I'm going to share with you all some staple makeup bits for the summertime. Disclaimer: items marked with * have been gifted to me for review purposes. All opinions are 100% my own. 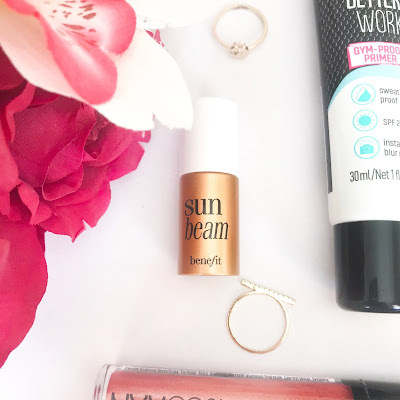 When I think of Summer makeup, it's all about glowy, lightweight, fresh products, so that's what I've tried to include here: basically, the products that will give you a glowy and awake complexion, whilst also ensuring your makeup lasts all day and your skin is protected from the sun, because we are not about that sunburnt, makeup slipping all over the place, look. 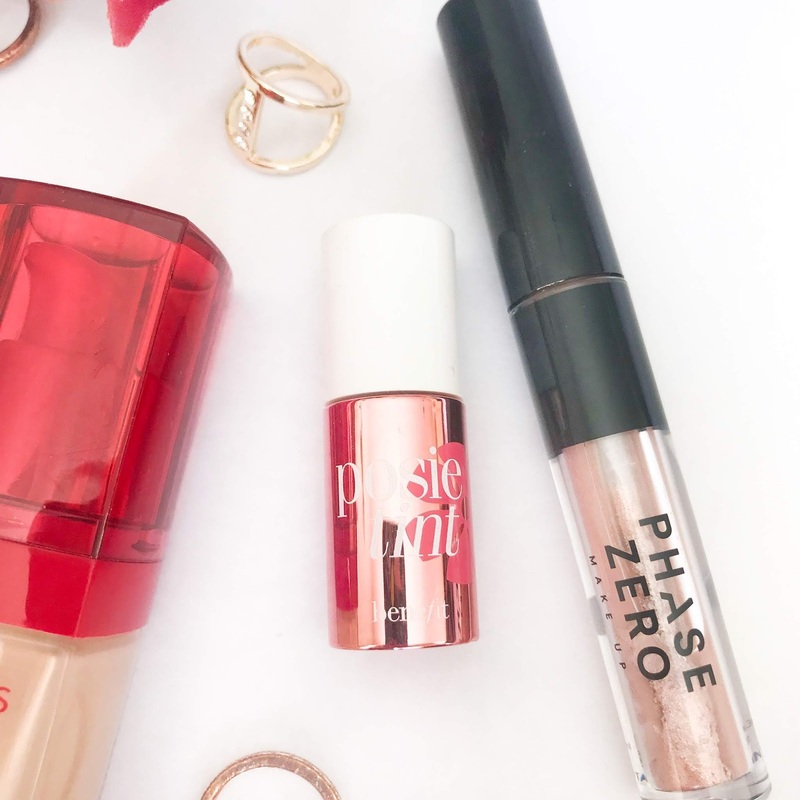 Starting off with base products, I think it's definitely an essential to have a good primer which will keep your makeup from slipping off in the heat, as well as protecting your skin underneath. 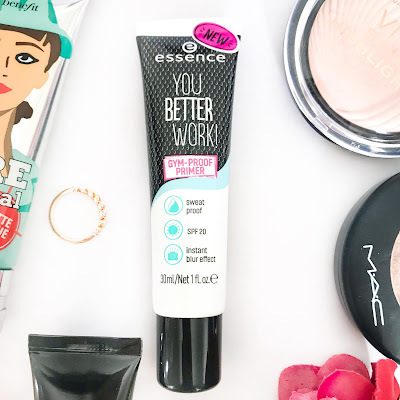 This Essence primer has SPF20 and is the only primer I've found to have such a high factor, which is amazing! Even if you don't want to wear makeup but still want your face to be smooth, poreless and matte, you can wear this primer and protect your skin at the same time (yay!). This is a great primer because it claims to be gym-proof, meaning it will stay on while you sweat during any heat waves in the summer. It also makes your skin very smooth and matte, perfect for applying your foundation and other base products on top. Another bonus is that it's only £3.50, an amazing bargain! Another essential for getting that glowy summer look, is a light and glowy foundation. Now, I have oily skin, so I'm not the biggest fan of glowy foundations, but this one is perfect for me! It's not overly glowy like some foundations I've seen, but it's just enough to give a fresh and radiant complexion. It has a light to medium coverage, so I tend to wear this on days when my skin is not riddled with spots (as it is at the minute), although it definitely can be built up, and I can get great coverage overall when I use my trusty Collection Lasting Perfection Concealer on top. The foundation is lovely to apply and feels super light on the skin, definitely one of my fave foundations of all time! If you're looking to switch up your foundation for Summer but don't want anything too glowy, then this is the one for you. 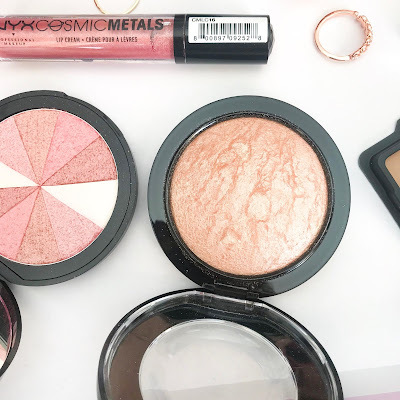 Another base product I love to use in Summer is a nice liquid blusher or highlighter, because they're nice to apply and look very fresh and glowy compared to a powder form. I love these adorable little mini products from Benefit which include the Posie Tint and Cha Cha Tint blushers and the Sun Beam highlighter. These are great products to take on-the-go and to take travelling with you, as they're small and super quick to apply: just a quick brush on the cheeks, blend in with your fingers and you're done! 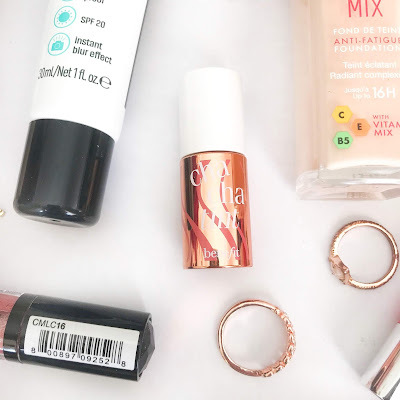 My favourite for a day-to-day basis is the Posie Tint, as it's a lovely pale pink colour, but I do love the Cha Cha tint for Summer, as it is a nice peachy-orange shade, as well as the Sun Beam, which provides a lovely golden highlight. Perfect products to use in the evenings on holiday when you've got a bit of a tan! This is one of my favourite blushers of all time because it is just so stunning. It's a multi-shade blusher, meaning you swirl your brush around the whole compact and get a gorgeous shade created from all the different colours inside. 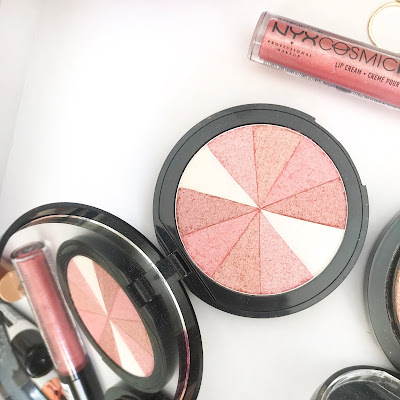 I think this blush is perfect for summer as all the shades are very shimmery, leaving you with a gorgeous glow to your cheeks as well as a beautiful pink shade. You can also just dip your brush into one of your shades if you prefer! This is another great product for travelling, as it comes with a mirror, meaning you can easily apply it on-the-go. Mac do amazing baked highlighters, bronzers and blushers, so if you're looking for one, I'd definitely recommend checking them out. This highlighter is one of my faves because it's not too shimmery or glittery, but provides a very natural glow to the cheekbones. I think they do a fair few shades of this, but mine is in Soft and Gentle. It's the perfect shade for Summer as it has a lovely gold tone to it, and looks perfect with pale or tanned skin. Another Summer makeup staple for me is a good bronzer. 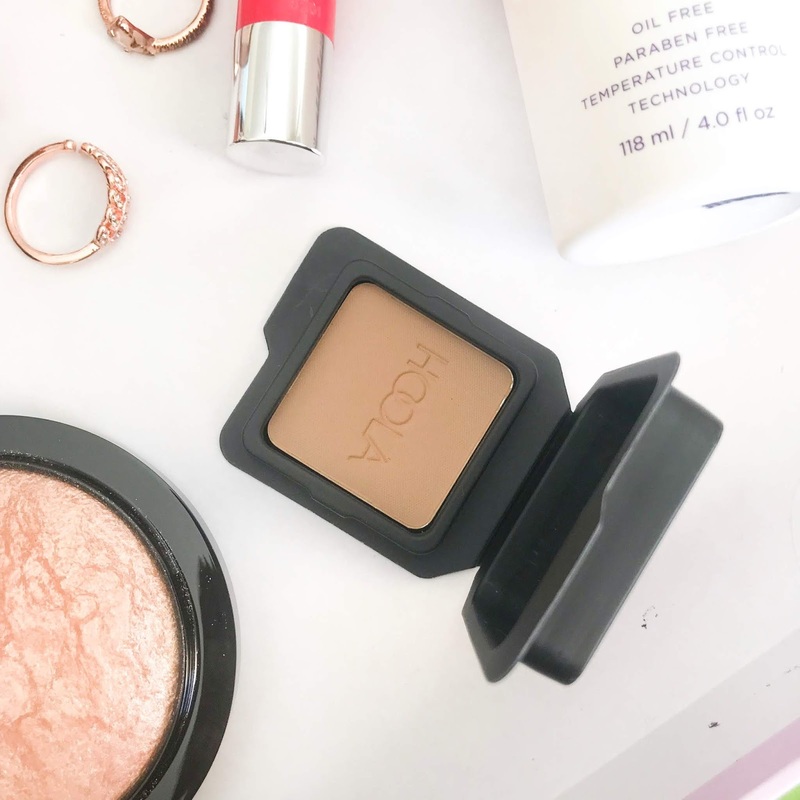 I wear bronzer all year round (when I'm doing a full face of makeup), as I like to add a bit of colour and definition to my cheeks, but I think it's definitely an essential in Summer, to give you that sun-kissed look. This Benefit one is one of my fave bronzers as it's not too dark for my very pale skin and is completely matte. It is very pigmented though, so be careful! I don't have many other bronzers so if you have any that you love, let me know in the comments! The final base product I'm going to mention is a good setting spray. As it's Summer, we're likely to be doing more activities, walking around in the heat (whether that be on holiday or at home), and if we're sweating, then you know our makeup is gonna come right off: Not. Fun. But fear not, as a good setting spray can help ensure our makeup is plastered to our faces and is not coming off (hooray!). My favourite is the Urban Decay All Nighter, as it effectively keeps my makeup in place all day and is very nice and easy to apply, sinking in straight away. If you know of any good highstreet/drugstore setting sprays then do let me know. Liquid eyeshadow has been a recent fave of mine, and I think it's perfect for summertime as it is easy to quickly swipe on, yet provides a lot of pigment and shimmer, helping to create that glowy look we all crave during the warmer months. This one is from Phase Zero* and I absolutely love it. It has a coconut water formula, so is super smooth to apply and is so pigmented. I tend to find powder eyeshadows don't show up very well on my lids so I like to opt for a cream or liquid to really get that pigment out. This one is in the shade Romance and it is a stunning pearly pink shade which again, is a perfect shade for summer. If you're interested in checking out any Phase Zero products, you can get 90 days free membership on Love Me Beauty and if you use my code TRXPICAL05, you get £5 off your first purchase (not including P&P and item(s) must be over £5). 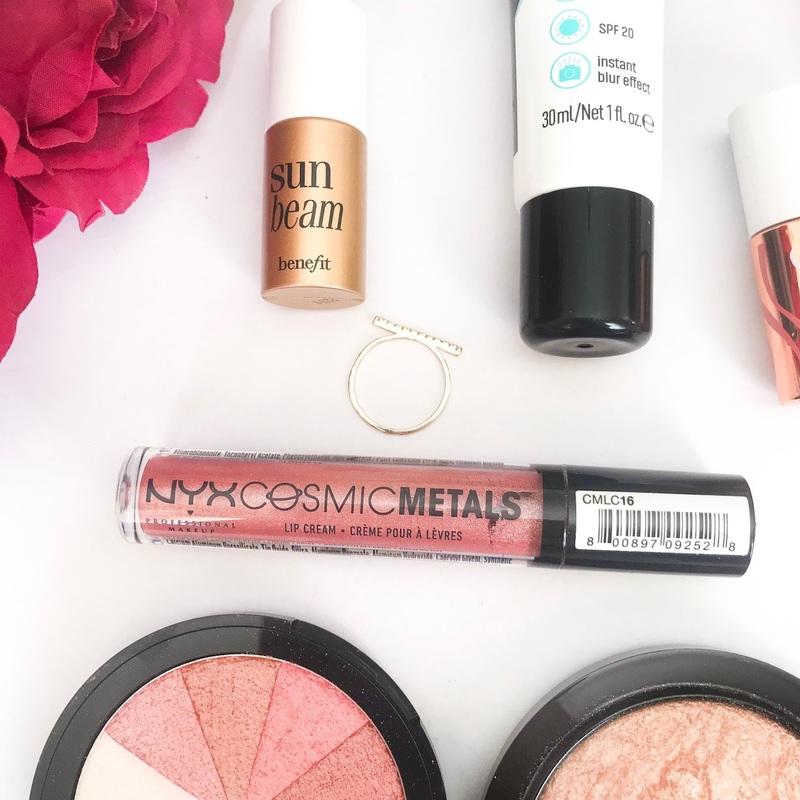 I'm not entirely sure why metallic lips came into my head when I thought about Summer makeup, but I'm guessing it's because they're glittery and sparkly, perfect for a Summer evening or night out. My favourite is this one from NYX, as it's not crazy glittery and gives a gorgeous rosy-pink shade, perfect on its own or on top of another lipstick. I think it just adds a little something to your overall makeup look, and I always love a gloss during Summer as they're light and easy to apply. Again, this is kind of a random one, but a nice glossy red lip seems to scream Summer for me. I think a nice bright red shade, but with a glossy formula, looks super pretty and fun with any outfit during the Summer. It just spices up your look and adds a bit of brightness and glow with the glossy effect. Of course this can also be achieved by a nice bright pink glossy lip, which I also love. My favourite lippy for a glossy red look is this Colour Boost lip crayon from Bourjois in the shade Red Sunrise, although I'm not sure they do this shade anymore as I can't find it online but they do other lovely bright summery shades. I really love lip crayons as they're so easy to apply and are super moisturising. This one is a gorgeous light red that isn't too overpowering due to the fact it has a lovely glossy sheen to it. 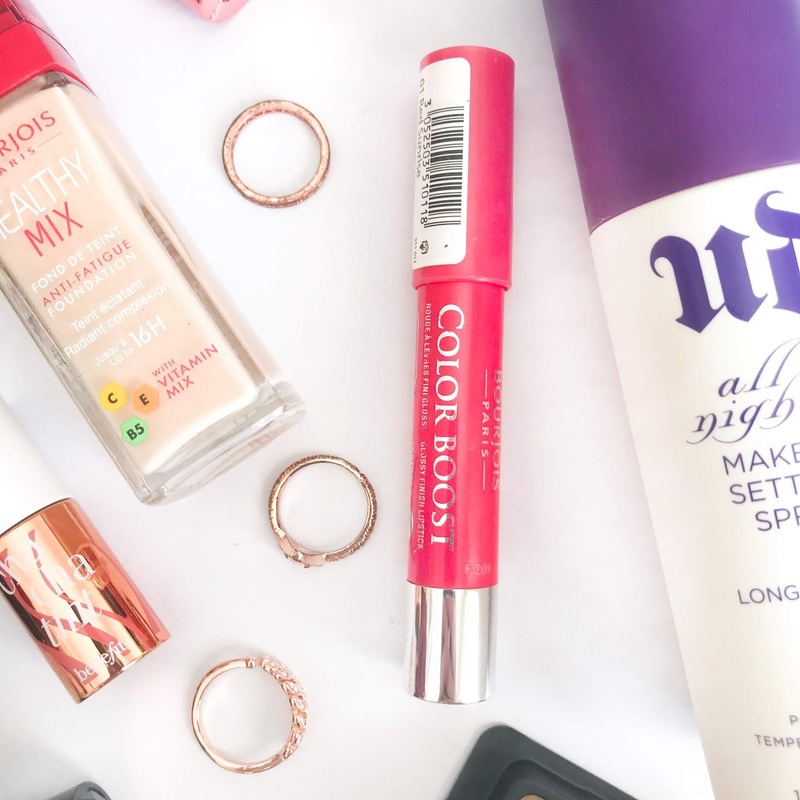 So these are some of my makeup staples for the Summer season. Let me know what products you love to use and wear in Summer, in the comments below! I've been using the sample of the Benefit Hoola Bronzer and I love it - it 's so natural that I also like using it as an easy eyeshadow for when I'm in a rush! Will definitely check out the other products too. I love using bronzer for eyeshadow too! Never heard of that primer but it sounds great I need to find me one of those! 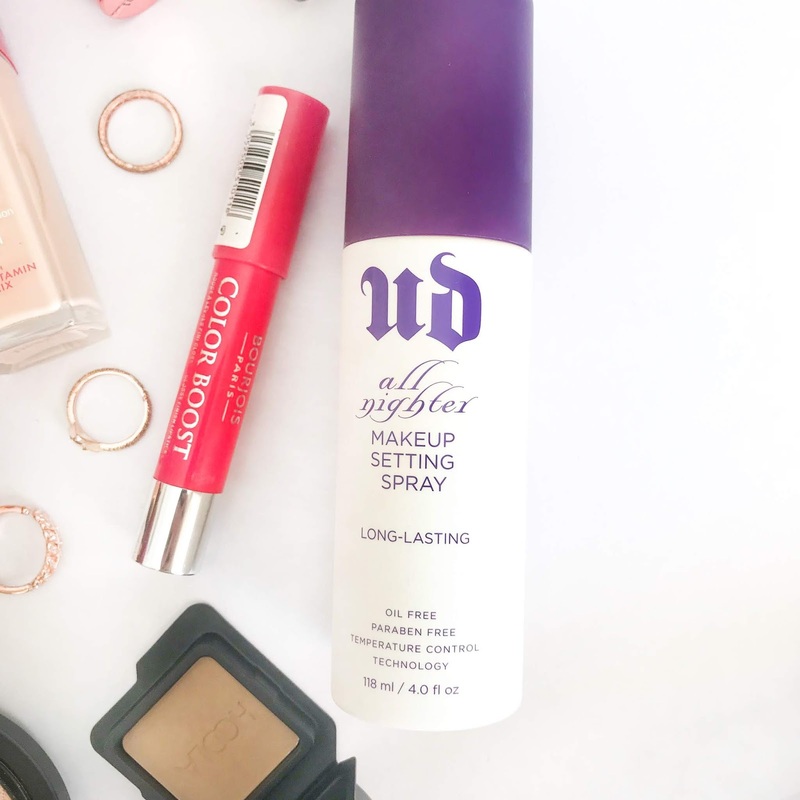 I also love the Urban Decay setting spray, my makeup never budges when I wear that! So many people love that Bourjois foundation I need to try it! I have dry skin, even in the summer, so I need to use more moisturizing products but I'm a big fan of liquid blush. I find it lasts so much longer and looks more natural. That blush palette is beautiful though! I've never tried those liquid eyeshadows but they sound great and easy to work with. The Benefit minis in this post are great liquid products! I love liquid eyeshadow because it's so easy to apply and way more pigmented! 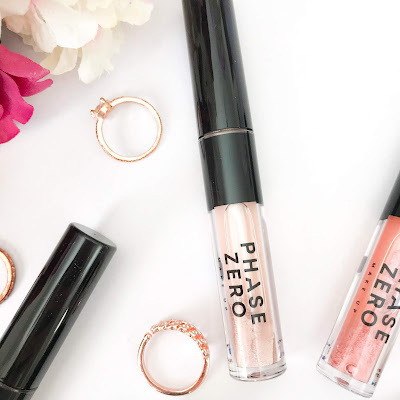 The Phase Zero Liquid eyeshadow sound amazing and the two shade's you picked up are gorgeous. I need to look into that primer and setting spray as my current picks worked wonderfully in the winter but aren't quite up to the increasing heat! I love soap & glory. Their products are so instagrammable and the packaging is amazing but most of all the quality is great! nyx is also a fav brand of mine! They are some of my fave brands too! I absolutely love essence and have been meaning to pick up that primer! I hardly ever use blush, because my skin has a pinkish-red tone already. Maybe if it came in other colors, I could use it. The metallic lipstick looks neat. I've not tried the Cosmic Metals yet, but I did pick up a couple of Nyx's Duo Chromatic lip glosses and they're gorgeous for summer! They totally spruce up your look and make you feel like your rocking almost a festival vibe even if you're just going about your day to day. I need to try that setting spray though, I've heard nothing but good things about it and I still haven't got one! 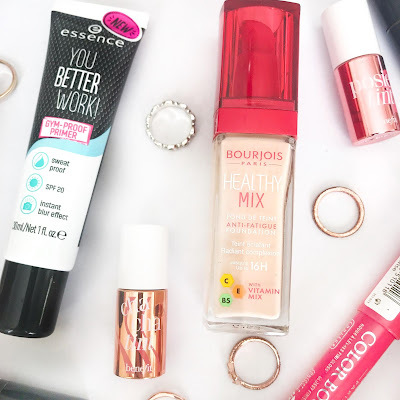 I would love to try the Bourjois Healthy Mix Foundation. Seen a lot of good things about it but I’ve never got round to actually trying it! OMG! I love the healthy mix foundation. I've never actually hoola before *gasp* I know but it looks so good for the summer. I've never actually tried soap and glory blush before either. Time to load up my Ulta cart. This is such a lovely post! I’ve never heard of this Essence primer but i’ll definitely check out, i really need a new primer! I went to England recently and I picked up that Healthy Mix foundation because I hear so much about it from all the British bloggers I follow. I cannot wait to try it! So many of my favourite products! 😍 you have great taste. I love NYX lip products, but I don't think I'm brave enough to pull off their metallic range!